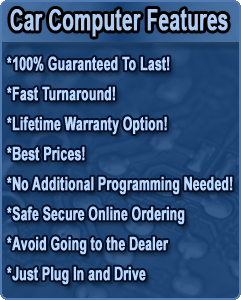 We offer an Iron Clad standard 1 year unlimited mile warranty on your computer with a core exchange, as set out below. If your computer fails for any reason during that year, we will exchange it for another computer that is equal to or better than the original supplied computer. 1. Extended Warranty. You may upgrade to a 2 year warranty for an additional $50.00 or a lifetime warranty for an additional $100.00. Simply select the warranty upgrade option of your choice when adding an item to your shopping cart. 4. Core Policy. “Core” is defined as the original piece being replaced. In order to activate your warranty, you must return your old part to in the postage paid box or envelope you received with your part. The core must be sent within 21 days to activate chosen warranty. If the core is not shipped to us within 21 days the purchased part will have no warranty coverage. However, if a core charge was applied at the time of purchase or the part was sent in to be repaired & returned the applicable warranty will issue.